General Hospital (GH) spoilers reveal Ava Jerome (Maura West) is willing to do anything to get her beautiful face back, especially after being rejected by GH’s Dr. Griffin Munro (Matt Cohen). Ava firmly believes that if she were beautiful, Griffin wouldn’t be hiding behind his vows as a priest, using them as the reason he won’t give into his feelings nor become intimate with her. What if that weren’t true at all and in fact after rejecting Ava, Griffin’s friendship with her daughter, Kiki Jerome (Hayley Erin) on deepens and he chooses to break his vows for her? Both Griffin and Kiki care deeply about Ava and her well-being and both share a deep passion for their patients in the medical field. General Hospital spoilers have explained that Robert Palmer Watkins, who portrays Dillon Quartermaine, Kiki’s boyfriend, is no longer on contract which surely means he will not be around too much, giving Kiki and Griffin ample time to explore their feelings for each other, and the door wide open for a new romance. It is blatantly obvious that Ava has feelings for Griffin, deep enough that she would risk her body and soul (what remains of it! ), thanks to the deal she made with the devil, Valentin Cassadine (James Patrick Stuart) in order to look beautiful again. All because Ava is convinced Griffin rejected her over her severely burned face. Imagine how she is going to feel when she returns to Port Charles and see that Griffin moved on with her gorgeous daughter, Kiki! 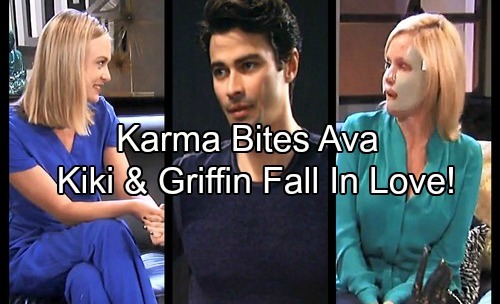 General Hospital spoilers tease that this is definitely karma for Ava. Fans of the ABC soap will remember how cold-hearted Ava was towards Kiki, when she had an illicit affair with Kiki’s then boyfriend, Morgan Corinthos (Bryan Craig) – even returning from the “dead” pretending to be Aunt Denise, in order to steal Morgan’s heart once again. The question on everyone’s mind is whether Ava has truly changed since being burned, or will she turn back to her old ways and become the selfish, spiteful woman we have all grown to love to hate and hate to love? Of course, Ava has never been one to be selfless, she has never stepped back and made her daughter’s happiness her number one goal. It seems she has been humbled by the tragic fire she herself started in her warehouse that almost destroyed her, so it is possible she has changed. Mind you, if she has truly changed she never would have become so shallow, thinking Griffin couldn’t love her because of her scars. Will Ava step aside and allow Kiki and Griffin to explore their feelings for each other or will she turn into a vindictive witch, feeling that Griffin belongs to her? Be sure to tune into ABC’s General Hospital (GH) to catch up on everything happening right now in Port Charles. Check CDL General Hospital spoilers often for updates and news! Will Ava Accept Kiki’s Romance With Griffin? General Hospital (GH) Spoilers Weekly: Dante & Dillon Throw Down Over Lulu – Olivia Lies, Liz Panics and The Jackal Digs! General Hospital (GH) Spoilers: Dillon Makes a Play for Lulu as Marriage to Dante Crumbles – What Does She Do? General Hospital Spoilers: GH Serial Killer Paul Murders Sabrina – Happy Nursing Job News Turns To Tragedy? General Hospital Spoilers: Nelle Working For Secret GH Mystery Character – Trying To Destroy Sonny?